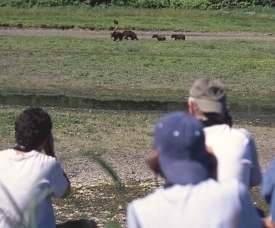 Pack Creek brown bear viewing area is located south of Juneau on Admiralty Island. Careful management of people allows the bears to interact, fish for salmon and go about their lives under the eager eyes of wildlife watchers at the estuary and from a viewing tower one mile upstream. Forest Service and/or Fish and Game staff are present during the peak viewing season. Bears are active throughout the summer, but the prime viewing months are July and August when the salmon runs are at their peak. Keep your eyes open for other wildlife while visiting Pack Creek. Admiralty Island also has the world's highest density of nesting bald eagles, and you might also spot river otters, harbor seals, Sitka black-tailed deer and dozens of bird species. The observation tower at Upper Pack Creek is a great viewing and photography spot, but only accommodates a handful of people at a time. Plan to spend many hours at Pack Creek to insure you get a chance to watch and photograph bears from the tower. Visitors arrive by floatplane, boat or kayak. Commercial and self-guided options are available.